Yanweizhou is in the urban heart of Jinhua city (population > 1m) in China and it is managed by the municipal Government. It was for years an underdeveloped natural riparian wetland (>64acres). Located where two rivers converge to form Jinhua River. Beyond this tail, riparian wetlands had already been eliminated by the construction of an organically shaped opera house. Before the interventions, the three rivers (each > 100 meters wide), divided the densely populated communities in the region. The inaccessibility led to the underutilisation of the surrounding cultural facilities, and the adjacent green spaces. The remaining 50-acre riparian wetland was fragmented or destroyed by sand quarries. The existing wetland was covered with poplar trees and Chinese Wingnut that provided habitat for native birds. Preserve the remaining patch of riparian habitat while providing amenities to the residents of the dense urban center. Identify best approach to flood control (prevention with a high, concrete retaining wall or cooperation by allowing the park to flood). Integrate the existing building into the surrounding environment to create a cohesive landscape. Water resilient terrain and planting design: Resilient spaces are created to fulfill the need for temporary, intensive use by the audience from the opera house, yet are adaptable for daily use by people seeking intimate and shaded spaces. The river currents, the flow of people, and the gravity of objects are all woven together to form a dynamic concord. 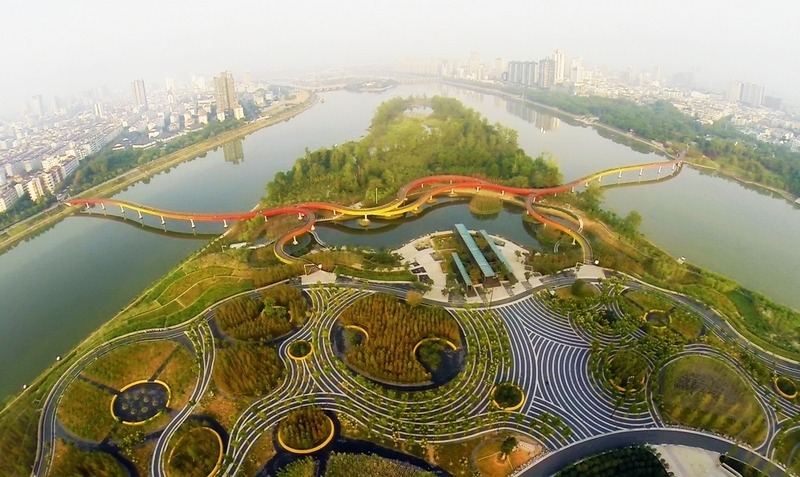 This is achieved through the meandering vegetated terraces, curvilinear paths, a serpentine bridge, circular bio-swales and planting beds, and curved benches. The project has given the city a new identity and is now acclaimed as its most poetic landscape. The park is a proven success. After it opened in May 2014, an average 40.000 visitors used the park and bridge each day.